Are you considering the idea of getting a website built for your small business? Then this detailed guide to website planning is for you. You’re almost done with your initial website planning work. In this phase of the site planning process, we are going to set up an initial blogging schedule, define what type of content you will create for your website or blog, and decide who will do what on your site. You need to publish content regularly for your digital presence to grow. A content publishing system is the most productive and effective way to plan, schedule and track your content creation and publishing process. Now that you have created an initial list of content ideas, the next step is to set up an initial blogging or content publishing schedule. Although this step may not seem to be directly connected with building your website, by creating your content publishing schedule and then thinking about what types of content you will need to create and who will be responsible for managing the content production and publishing areas (see Steps 9 and 10 below) will help you understand what kind of additional services or resources your business will need to have in place immediately after your site has been built. Publishing fresh content on your site on a regular basis is very important for building an online audience and for helping your site’s search engine rankings and results. This is the step where you actively market and promote your business using content, and so it’s essential that you develop a habit of publishing content on your website on a regular basis. For example, start by making a commitment to publish a new post each week or fortnight to your website or blog. 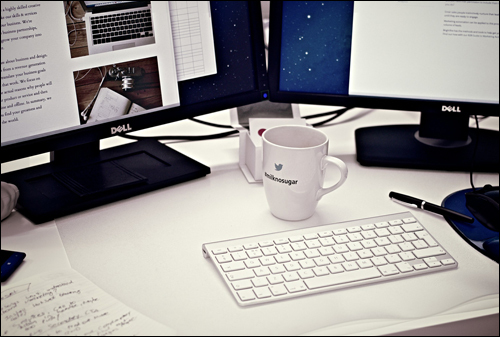 Decide on a specific weekday and the time of day that you will sit down to create your posts. 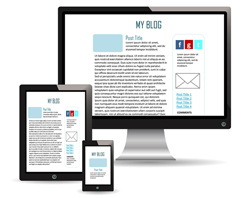 Allow 1-2 hours to create and publish (or schedule for publishing) each article or blog post. Now, commit to making this into a regular habit. Keep monitor your activity and if you need to, readjust your schedule accordingly. Remind yourself when you sit down to write your content that you are you are working on growing your business, instead of just simply working in it. If you plan to publish content regularly (and you should! ), having content scheduling tools can help keep your workflow organized. 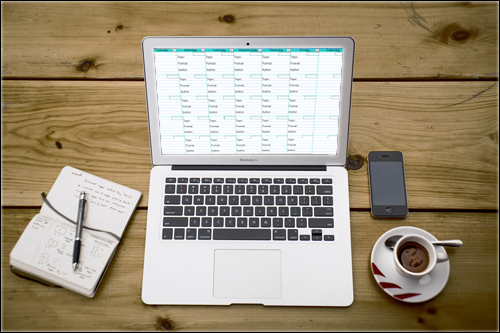 You can use simple spreadsheets to help schedule and track your content creation process, or use a WordPress plugin. Publish Date: The date you plan to publish the content. Tip: You can use color-coding to indicate when your content has been published. You can also add another column to record 1) the date your content needs to be created by, and 2) the date your content is scheduled to publish on your site or blog. Category: If you are publishing content to your blog, enter the category you will publish this item under. Offer: What is this specific item of content designed to help you sell or promote? Specify your offer or call-to-action here. Headline: Enter your article or blog post headline, title of your content item, etc. Description: Enter a brief description or purpose of the content here. SEO: The main keyword targeted by your content. Short URL: Add a shortened version of the content’s destination URL for promoting on Twitter, or tracking your campaigns. Editorial Calendar is a Free WordPress plugin that allows you to see all your posts and drag and drop them to manage your site. The Editorial Calendar provides content editors with an overview of your scheduling and when each item will be published. 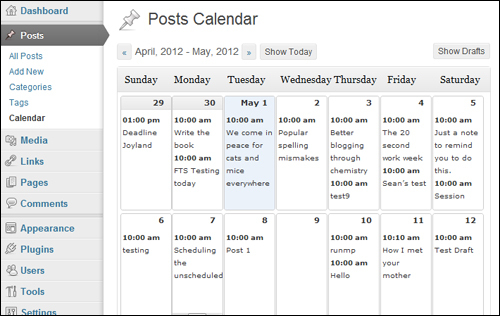 You can drag and drop to move posts, edit posts inside the calendar and manage your entire blog. Edit Flow is a modular editorial workflow plugin that allows you to collaborate with your editorial team inside WordPress. 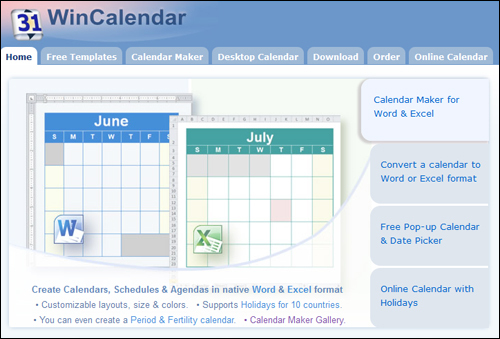 Calendar – A convenient month-by-month view of your content. Custom Statuses – Define key workflow stages. 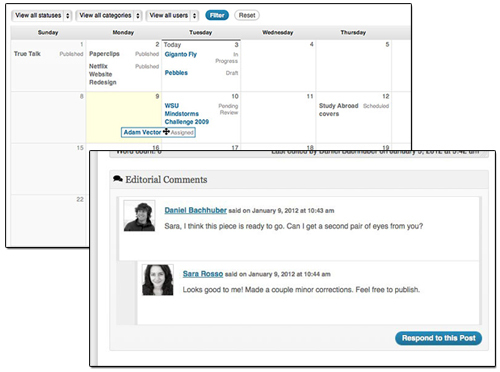 Editorial Comments – Threaded commenting inside the admin for private discussion between editors and writers. Editorial Metadata – Track important important details. Notifications – Lets you receive timely updates on the content that you are following. Story Budget – See your upcoming content budget details. User Groups – Organize your users by function or department. Oasis Workflow is a powerful feature-rich plugin that allows you to automate any editorial workflow process using a simple, intuitive graphical user interface (GUI). Some of the features of Oasis Workflow include the ability to configure your work flow using an easy drag and drop designer interface and simple process/task templates. 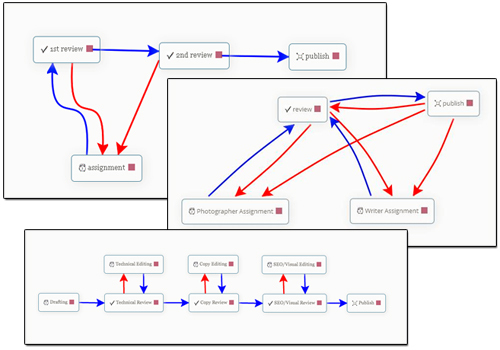 This plugin also lets you assign tasks dynamically using role-based routing, lets users view their current assignments and sign off on their tasks once it’s completed, process history for auditing purposes, task reassignment, due date and email reminders to help you to publish your articles on time, and an out of the box editable workflow to help you get started. Oasis Workflow also has a “Pro” version that includes additional functionality, such as allowing you to create multiple workflows, copy workflow and copy steps, auto submit, revise published content and much more. What Type Of Content Are You Going To Publish On Your Website? After setting up a schedule for creating content, the next step is to decide what type of content you are going to create to publish on your website. Knowing what kinds of content you plan to create for your website is useful, because this helps you understand what other technologies and resources you will probably need to purchase or budget for in order to create the content. This could include buying video screen capture software for videos and multimedia presentations, slideshows, etc. Who Will Be Responsible And Accountable For All Aspects Of Running Your Site? The final step in your website planning process is to decide who will be responsible for managing the various aspects of your site and content and assign these to the resources you have available, or consider outsourcing. 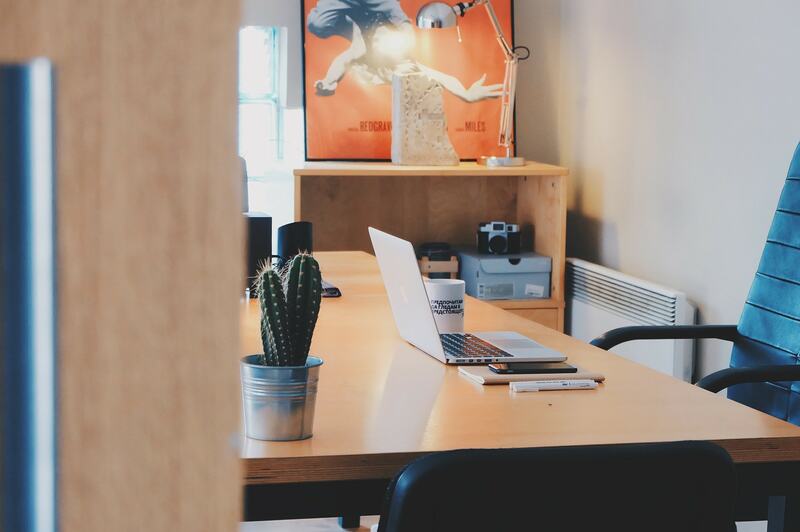 There are many roles and responsibilities involved in running a growing digital presence. Who will perform the content creation work (e.g. researching, writing and proofing, sourcing and creating graphic content and logos, videos, audios, newsletter content, training content, FAQs, etc.)? How will you communicate what needs doing to others? How will people communicate with each other to ensure that different parts of the project get completed on time and on budget? Who will manage the actual scheduling and publishing of content on your website or blog and update any outdated content? Who will promote and market your site with search engine optimization, online advertising, social media marketing, video marketing, etc.? Who will be responsible for setting and monitoring the budget for all of the above areas (including budgeting for the cost of getting your site built)? Who is going to be accountable for all of the various areas of your site? Depending on the resources you have available, it may be just one person doing everything (e.g. 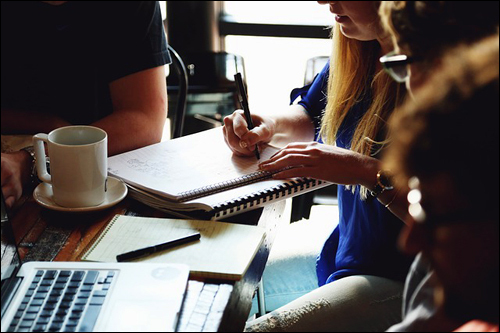 you), or a small team of people who also have to juggle other areas of your business, and perhaps even some outsourced help. 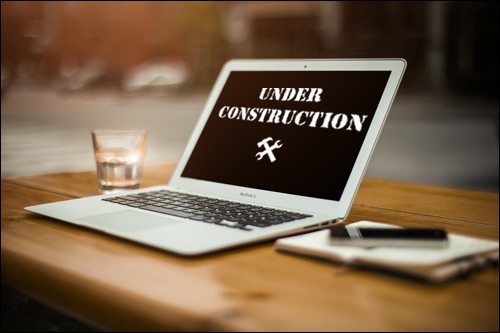 If you don’t know the answer to the above questions before getting your website built, you could end up spending a lot of time and money building something that will not only not help you grow your business, but cost you valuable money and time. 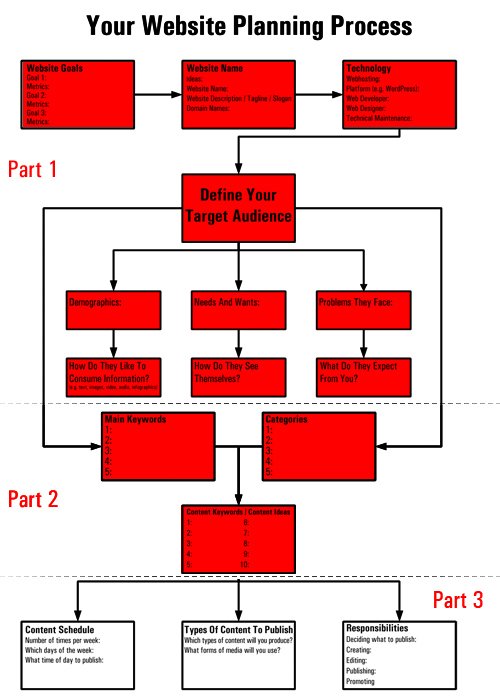 Document or flowchart exactly who will do what in terms of managing your website and content creation. Focus on documenting which roles should be responsible for the processes involved before assigning names to responsibilities or making people in your organization accountable for managing these. This will help you understand how much responsibility and work is involved in each part of the process, explain why you are asking people to take on additional responsibilities, and assist you in planning the allocation of resources accordingly. Congratulations! You have completed all the sections of the website planning processand can now begin looking at options for getting your website built. Hopefully now you have a better understanding of the web site planning process and how WordPress can help you grow your business business online. See other posts on this site or contact us for information or assistance with any of these areas.